Crystal malts are a staple in almost every beer recipe. Light crystal malt, like C-20, is used in pale ales, the darker C-120 can be used in stouts, and every recipe in between calls for some variety of crystal. Since crystal malts are among the few styles that do not need to be mashed, they are ideal for extract and partial-mash brewers to use as steeping malts. Anyone can make this fabulously versatile malt at home. All it takes is any standard pale malt, some water and a few hours in the oven. 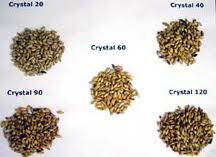 Crystal is a convenient brewer’s malt because the carbohydrates in the grain are converted to sugars prior to roasting. This process not only makes it possible to use it as a steeping malt, but it also creates proteins that improve body and head retention. The sugars produced are not easily consumed by yeast, so they remain in the beer after it’s fermented which increases sweetness, flavor and mouthfeel.